Sandhill Cranes [Grus canadensis] are big as birds go. In the North American family of cranes only the Whooping Crane [Grus Americana] stands taller. The Greater Sandhill Crane stands 46 inches tall and the adults have a bright red crown and a piercing yellow eye. An adult may weight in the excess of 10 pounds, and while not normally considered dangerous they do have a long sharp black beak that can be quite impressive when you are ‘up close and personal like.’ That was the case for me just a few days ago on a local spring creek near my home in Montana. 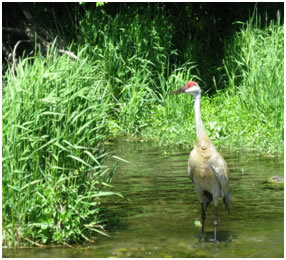 For several weeks a female Sandhill Crane had been sitting on a nest that she had built on a small island in the middle of DePuy’s Spring Creek. 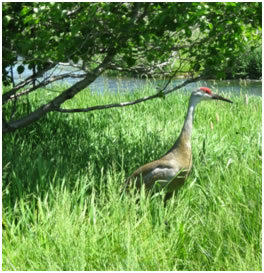 Despite their size, nesting Sandhill Cranes are quite difficult to locate. The female builds a relatively flat nest from dry grass, and when she is incubating the eggs she sets very flat and extends her long neck out parallel to the ground. We discovered this particular female when we accidently wandered too close to the nest. Instantly she rose from the ground, wings extended, crest feathers raised, and calling loudly. She moved toward us in a menacing manner, and we beat a hasty retreat. In the intervening weeks we watched her from a respectable distance, and as the grass grew taller and taller she became even harder to detect. 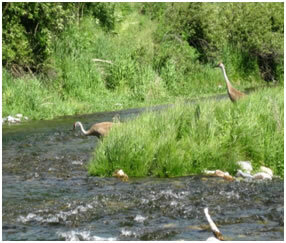 After checking my Mountain Bluebird boxes last week I decided to stop at the creek to check on the cranes. With the approach of the PMD hatch I knew that angling pressure would soon be increasing, and I hope that the chicks would hatch before the onslaught of anglers arrived. They seemed to be watching me, but they did not seem to alarmed by my presence. From their behavior I thought that the young were somewhere in the high grass, but since I could not see the actual nest from my location I could only speculate upon the actual presences of the young birds. Donning my hip waders that I keep in my vehicle for just such occasions as this I slid across the channel separating me from the nesting island. 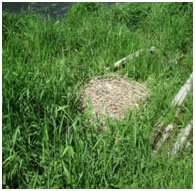 As I approached the nest it was obvious that it was empty. The young had hatched, which confirmed my suspicions. Now I waded across the channel separating me from the larger island where the two adults were pacing nervously through the tall grass. One of the adults, likely the male bird, took flight right over my head, calling loudly. If you have never heard an adult Sandhill Crane call just a few feet above your head you’re in for a rare treat. It must sound something like a Pterodactyl from somewhere in the prehistoric past. When I got to the island the other adult had waded off the island and was glaring at me from the far bank. As I walked along the bank she [I presume it was the female] turned to face me; standing fully erect with her piercing yellow eye intently watching my every movement. As I moved slowly through the grass the adults continued to call loudly, and I knew that somewhere in the maze of green the young were hiding. I have found Sandhill chicks before and I know that despite their relatively large size they can hide quite effectively. As I was concentrating on finding the young I failed to notice that the adult bird, that I presumed was the female, had crossed the channel and was right in front of me. At close range the size of these birds is always somewhat surprising; even for someone that has worked with all manner of birds for over 45 years. The adult bird matched me step for step obviously trying to keep me away from where she had hidden the young. Young cranes are called ‘colts,’ a seemingly strange name for a young bird. I discovered one colt hiding in the tall grass, and it promptly dashed away to hide under the dense growth of some Cow Parsnips [Heracleum lanatum] that are growing on the island. Having found the one colt I decided to leave the family in peace. As I walked to the edge of the island the adult bird became more and more agitated, and when I reached the edge of the water I discovered the source of its agitation. 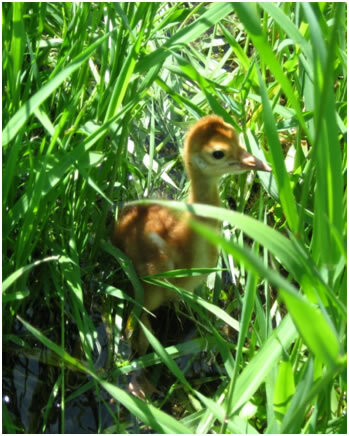 A delightful young Sandhill Crane colt hiding in the tall grass at the edge of the stream. Note: It is unlawful to disturb nesting waterfowl. 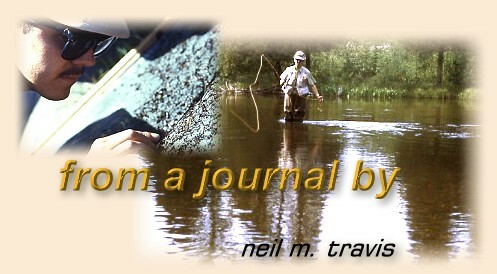 The author is a licensed federal bird bander with over 45 years of working with wild birds.